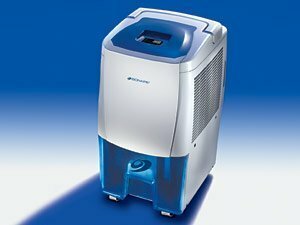 This dehumidifier covers rooms up to 2,500 square feet and has a wireless status indicator (uses four AAA batteries, included). It has a SmartTouch digital control and comes with an auto defrost. Other features include an auto shutoff protection with alarm, a continuous drain option, a front-loading water reservoir that's visible, a dual air filtration system and casters for easy mobility. Holds 40 pints.